Image used by permission statschew via Pittsburgh Penguins / Flickr. We’ve been hearing those words since Saturday’s shooting in Squirrel Hill. But we’ve also been seeing them dramatically put into action. The spirit of community swiftly crossed cultural lines here in Pittsburgh: The city’s Islamic community immediately began raising funds to assist the families of the shooting victims. Mayor Bill Peduto tweeted yesterday that they had raised enough funds to pay for all 11 funerals. And the Islamic Center of Pittsburgh will join with a group of organizations (including local AME, Catholic and Methodist churches, B-PEP and the Pittsburgh branch of the NAACP) to hold an interfaith prayer service on Thursday at 6 p.m. at Bethel African Methodist Episcopal Church. 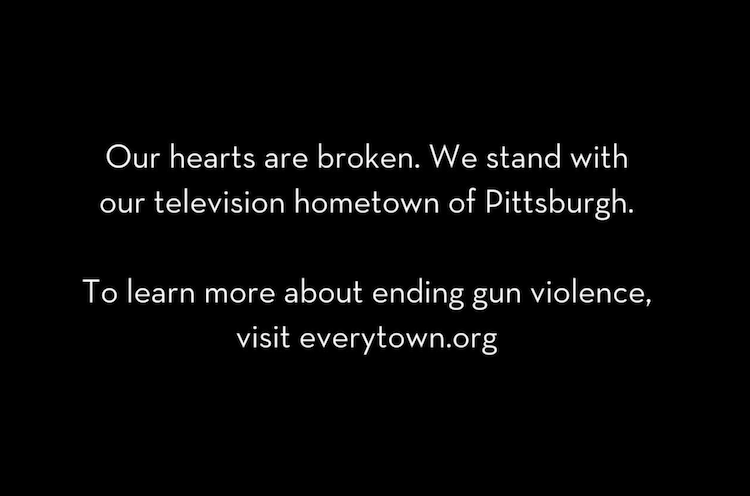 Sunday’s Steelers game began with a moment of silence and a prayer for the shooting victims. And Pittsburgh police officers Mike Smidga and Anthony Burke, along with Pittsburgh Police Chief Scott Schubert and three members of the Jewish Federation of Pittsburgh, were welcomed into the Penguins’ locker room and greeted on the ice by a standing ovation from fans at Tuesday night’s game. 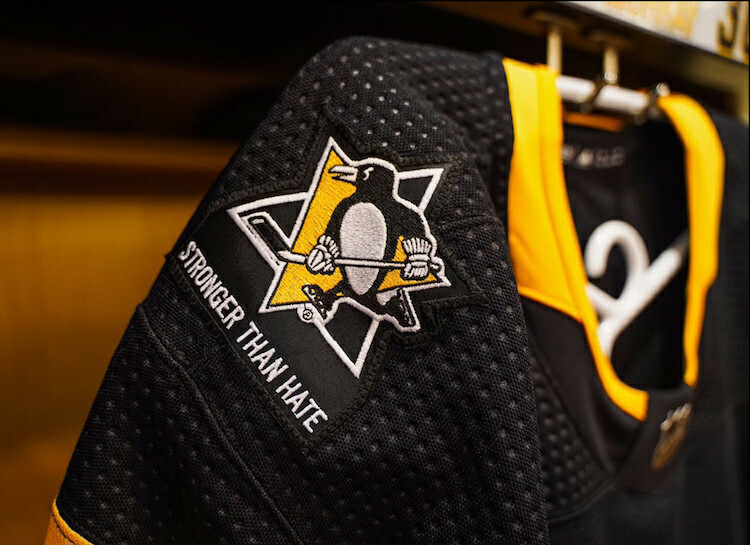 The Pens wore “Stronger than Hate” patches on their jerseys. Title card at the end of “This is Us” episode on Oct. 30, 2018. Meanwhile, many local organizations including the Allegheny Conference are helping to spread the word about the Jewish Federation of Greater Pittsburgh’s Our Victims of Terror Fund. And along with so many local museums and businesses that have offered free admission or services to comfort our grieving city, new efforts keep emerging. 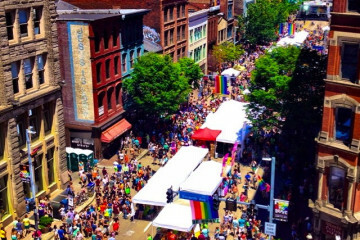 The Delta Foundation of Pittsburgh, a nonprofit advocacy organization for the LGBT community, has announced that their “Countdown 2 Vote” concert scheduled for this Saturday, Nov. 3 where pop star Kesha will perform, has been renamed the “Stronger Than Hate” concert. Proceeds will benefit the Our Victims of Terror Fund. And Troy Hill’s Scratch F&B restaurant is hosting a potluck dinner and cocktail fundraiser for Tree of Life that’s also a day of support for their staff. Since restaurant workers often lose out on tips and pay if they take time away from work to vote on Election Day, Scratch’s owner Don Mahaney is giving his staff a paid day off this Tuesday, Nov. 6, but he’s not closing the restaurant. Instead, he’s inviting the community in for an evening of togetherness. Pittsburghers are encouraged to bring a potluck dish to share. Guest bartenders will be serving refreshments and all tips will go to the Tree of Life Or L’Simcha Congregation.